Since I don’t say it anywhere in the post itself…Ducktales was pretty good. Since I don’t say it anywhere in the post itself… Ducktales was pretty good. So I was poking through my enormous number of Gladstone/Gemstone/Whateverstone softcover albums of Carl Barks duck comics…you know, the ones that came shrinkwrapped with the trading cards, plus the handful that didn’t…the ones that came out one or two volumes a month for well over a decade…the ones where I occasionally add up how much those all cost me over the years and even with the employee discount I come up with a number that’s way higher than I care to think about…you know, those ones. Anyway, I was revisiting a volume or two after having watched the the premiere of the new Ducktales cartoon, which had put me in the mood for duck adventures of either a Barkians or Rosa-esque nature. And in there, tucked amongst the too-many slim albums, was the above Dynabrite comic. Now, I’ve talked about Dynabrite comics on the website before, but for the 5% of my readers out there who don’t have my every utterance committed to memory, let me ‘splain again. This was a Whitman imprint from the late 1970s that reprinted comics from the Gold Key library on nice, bright paper with good coloring, no ads, and under thicker covers. The books were a little larger than the standard comic book size, and staplebound. They cost a little more than their regular newsstand cousins, but were very nice packages of comics. 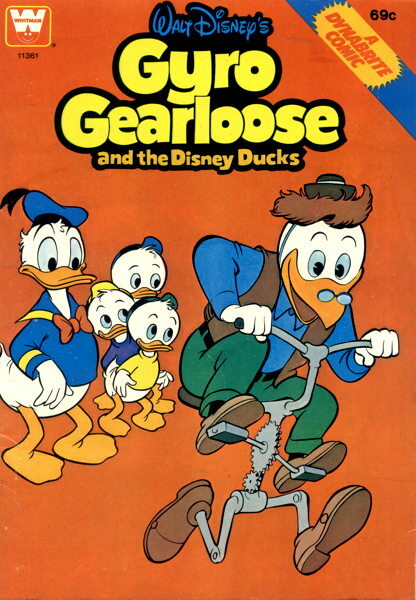 This particular example, Gyro Gearloose and the Disney Ducks , is from 1979 and reprints several Gyro stories by Barks published in Dell’s Four Color series from the late ’50s/early ’60s. I don’t remember when exactly I bought this, but it must have been sometime between my reentry into reading Duck comics in 1987 (when I followed Don Rosa to his first Scrooge story) and before the entire Barks run of Gyro stories were reprinted in album form starting in 1993. I don’t imagine I would have bought this after getting the same stories reprinted in upscale form in those albums, but then again, I’ve been known to double-dip occasionally on some comics because I happen to like the cover or because I’m crazy. Even as I look at this now, and I think “this is redundant, and I have a store, so I have someplace I can sell this,” I find myself not really wanting to. I mean, I could think about this in a weird collector sort of way, like “I should have at least one example of this particular publishing imprint in my collection,” though 1) I know full well what a Dynabrite comic is like, I don’t need reminding, and 2) who am i trying to impress, really? Well, sure, I’m trying to impress all of you, but now that I’ve blogged about this particular item, it’s served out that purpose. Even though my ownership of this item doesn’t date from my childhood, the characters are still a definite memory from that time. So really, for no good reason beyond that, I’ll be hanging onto this for a while longer. I think I had this one! It was the only Dynabrite that I had and I would have gotten it probably from the Goodwill bookstore. Since it was oversize, it didn’t stay with the rest of my collection but I might still have it in some magazine size boxes I used back then. I might have to dig for it..
My first ever Barks comic was a Dynobrite reprint of the Golden Fleece story. I think I must have read it (conservatively) a million times. 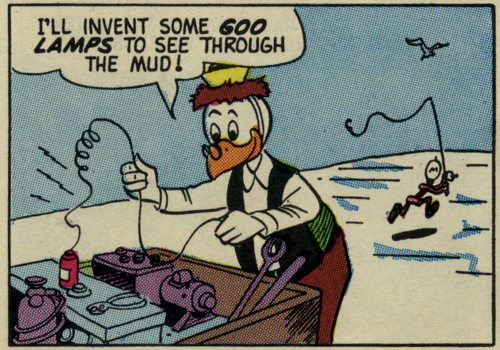 Now I’m trying to conceive of how Gyro’s bicycle with feet thing could work in real life. It seems possible, if pointless.